I really liked this book because it is set in Africa and I am very interested in Africa. 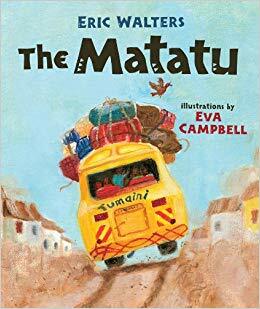 I learned that a matatu is a bus, a very important bus that carries people, luggage, goats, sheep, dogs and even chickens on the top! The illustrations are quite detailed and colourful. One of my favourite parts was when Kioko asked the conductor if he could wait for his grandfather and he said your grandfather is very important if you think you can stop a whole matatu for him. Kioko said he is important! Other people who would like this book are people who like their grandfathers telling them stories, people who like Africa and people who like stories about animals.